Sweet N Pink and 30!! Whoopie Pie... Whoopie Whoopie PIE PIE!! That's my song for the day.. now who's ready to bake!? Drop dough by heaping teaspoons onto the prepared baking sheets. Bake at 350 degrees F (175 degrees C) for 10 to 12 minutes. Beat egg white and mix with the milk, 1 teaspoon vanilla and 1 cup of the confectioners' sugar. Mix well then beat in the butter and the remaining cup of confectioners' sugar. Beat until light and fluffy. 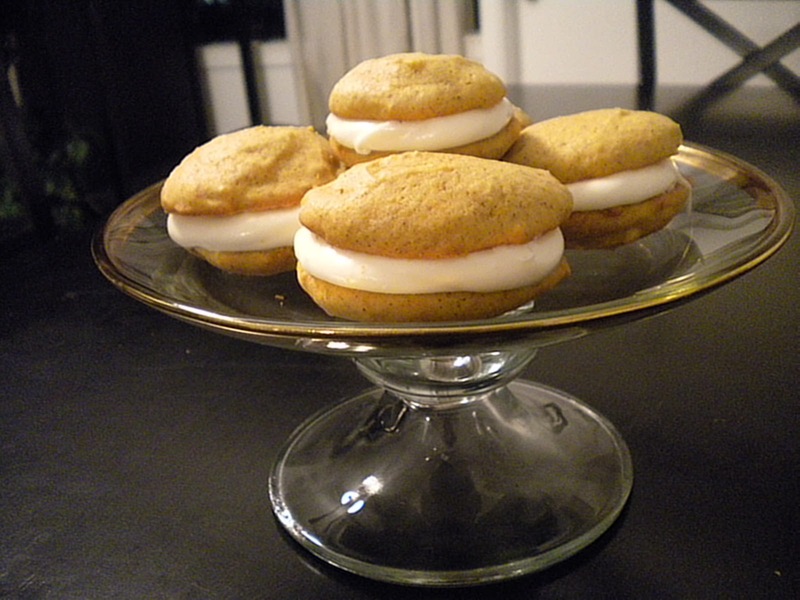 Let cookies cool then make sandwiches from two cookies filled with Whoopie Pie Filling. Next to create the cupcakes. Recipe + Ingredients borrowed from the Cupcake Project... Thanks! In a medium-sized bowl, whisk flour, baking powder, baking soda, and ginger. Beat in eggs, sour cream, and lemon extract until blended. Mix in flour mixture. Fold in apples. Divide batter evenly among cupcake liners. 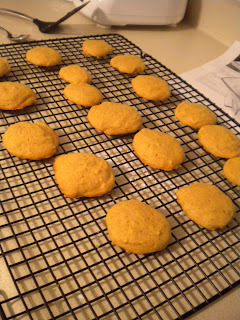 This is how they turned out. I had filled the cups pretty much to the brim and they didn't overflow at all. Onto the Frosting. 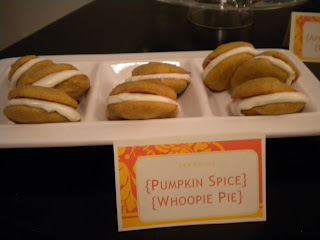 The Cupcake Project suggests using a Pumpkin Pie frosting.. which is literally pumpkin pie piped onto the cupcake!! I decided to go with what I had on hand... and it was the traditional cream cheese frosting delight. Cream the Butter + Cream Cheese together first then add in vanilla + powdered sugar. If it's too thick for you add some milk one tsp at a time..... and... Viola! Little Heavenly Delights! I am inspired by the simple things in life. I love making cakes & treats for special moments and just finding a reason to celebrate life! Cake Decorating Class with Carrie!!! November 10-11, 2014.